step 1: Fill your tummy with chocolate ice cream. 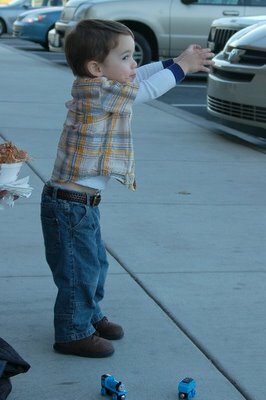 step 2: Hold your arms up in the air as far as you can reach. step 3: Jump really, really, really hard. step 4: Say, "Oh, I missed it." Let me also introduce you to Jonathan's newest addiction. He loves this new bunch of imaginative little--er--umm--people? We finally found a video at Wal-Mart and he wanted to watch it over and over, so we ended up getting another one. They are actually pretty cool little characters. They go on all sorts of adventures in their back yard through imagination and they sing and dance a lot--real songs--well not the Barney type anyway. 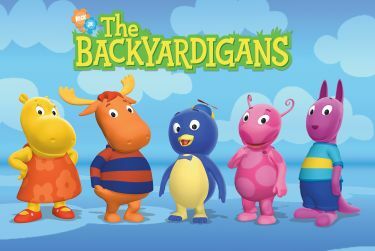 Found your blog on 2 peas and had to tell you that we love the backyardigans at my house too! The music and story lines are so adorable that I end up watching them myself or at least cleaning the house to the music.